The French government is under pressure to take tough action after Saturday's violent Yellow Vest protest in Paris during which dozens of shops, banks and restaurants on the Champs Elysées were ransacked. Some buildings were set on fire, several luxury shops were looted and 5 newspaper kiosques were damaged or completely destroyed. In all, around 80 shops and businesses were attacked. A family with 4 young children, including a baby, were rescued by police from their apartment above a burning bank. The children's uncle suggested that they were unsure whether to flee the burning building because they feared the violence below. The Paris Chamber of Commerce said on Sunday that employers and staff in the area are now “traumatized” after 18 consecutive Saturdays of sometimes violent protests by the Yellow Vests. Meanwhile, opposition politicians have reacted with fury to Saturday's events and the failure of the police to keep control. President Emmanuel Macron, who cut short a weekend skiing to return to Paris on Saturday night, is meeting key members of the government this Monday to decide how to ensure there is no repeat of such violence. The Junior Interior minister has admitted that the government failed in its duty on Saturday. Laurent Nunez talked of ultra-violent individuals descending on Paris and said police had been given instructions to intervene in every instance of looting “but it did not work”. The French riot police have added that they are exhausted after 4 months of consecutive weekend protests and their officers need rest. This weekend 5000 police and gendarmes were on duty in Paris against an estimated 1500 rioters. Attendance at Yellow Vest protests had been falling in recent weeks, but it is difficult to assess where the movement is heading. There have been signs for some time that what began as a grassroots protest against a fuel tax, has evolved into something different. French flags were much in evidence in the early demonstrations but those involved in the violence on Saturday sprayed anti-capitalist slogans on buildings and chanted “Revolution”. Police say that more and more of those they arrest describe themselves as anti-system. 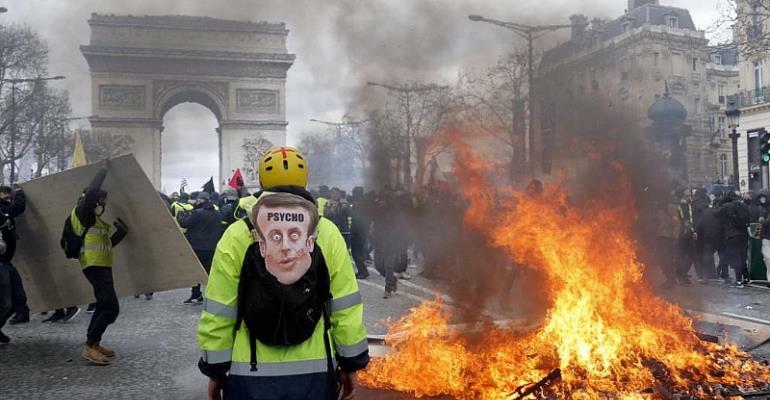 One of the prominent voices in the movement, Benjamin Cauchy said on Sunday that “the Yellow Vests have become a Trojan Horse for Black Blocs” [a violent ultra-left group who infiltrate protest movements]. The Economy minister is holding a meeting later today to assess the economic impact of 18 weeks of Yellow Vest demonstrations.